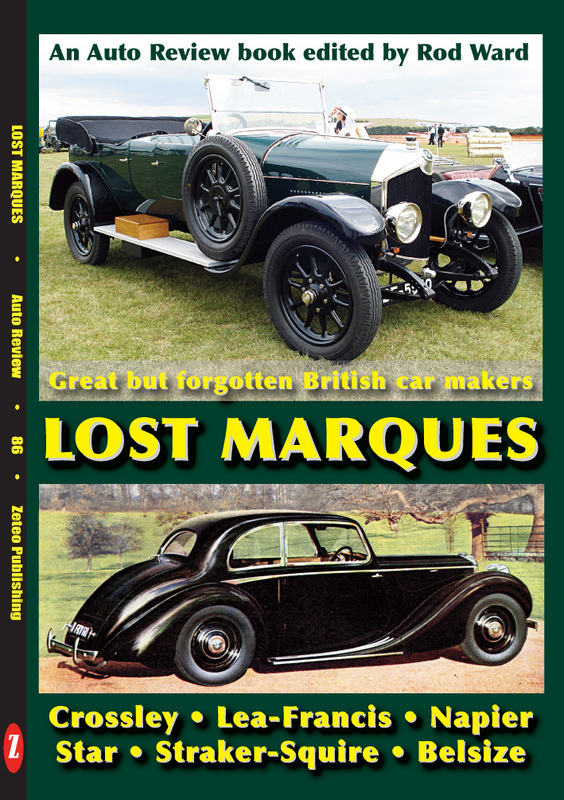 In this publication we tell the stories of six ‘lost’ great British car marques; Napier, Lea-Francis, Crossley, Star, Straker-Squire and Belsize. Of the six, only Lea-Francis was made in Coventry, the centre of the UK motor industry. Straker-Squire originated in Bristol, but after the Great War the company moved to London, where 75% of buses operated around 1910 were Straker-Squires. Napier were always based in London, and were regarded as the luxury car for the cognoscenti at a time when Rolls-Royces were only owned by arrivistes; for the first six or seven years of the 20th century, Napier was Britain’s leading car marque. Two of the makers noted here were based in Manchester; Belsize was one of the biggest British car makers in the pre-Great War era, with 1,200 employees. Crossley made cars and military vehicles in the Manchester area, and for a while they were favoured with Royal patronage before abandoning the car market to concentrate on bus production. Star of Wolverhampton had a great reputation for producing classy cars. The Editor’s grandfather, who owned a van for his business, had to hire a car whenever he wanted to take his wife and six children to the seaside. Of many cars he rented, a Star belonging to a local garage was his favourite. Like Belsize, Star was one of the six biggest UK car manufacturers in the years before 1914, yet it is virtually forgotten a century later. In this publication we tell the stories of all six great British car marques, in the hope that we can help to stop them becoming lost entirely. It is notable that none of these marques was absorbed by another car maker, so in this respect the tales told here are unlike many others we have covered in the Auto Review series. In fact, most of these car marques were only ‘lost’ when the owners voluntarily gave up car-making in order to pursue other, more profitable, activities. After abandoning car production, Napier concentrated on aero engines and Lea-Francis turned to general engineering. Crossley was taken over by AEC, and Star by Guy, both commercial vehicle manufacturers. Straker-Squire, whose designs formed the core of Bristol aero engines, and who were already in receivership, closed after the founder died in an accident.